In a 2014 book chapter titled 'Africa=Recycling: Continuities And Discontinuities In The Reception Of African Contemporary Art', Victoria L Rovine addresses the use of repurposed materials by high-profile artists like El Anatsui and Patrick Mulondo, seeing this "recyclia" as a question of authenticity. The implication, Rovine suggests, is that recyclia exists to fulfil a demand in the global art market, a left-liberal appetite for the local and the DIY in art from developing countries. It's tempting to see Congolese collective Konono No.1 as a musical equivalent, a group whose repurposing of pots, pans and car parts salvaged on the streets of Kinshasa has been central to its widely mediated image. In reality, the band now led by Augustin Makuntima Mawangu is too extraordinary to be reduced to that critique, the frayed incandescence of its distorted likembe thumb pianos too singularly hypnotic. Nevertheless, the release of their first album in six years - also their first full-length collaboration - seems an appropriate moment to reexamine the Konono phenomenon. The story of DRC's premier musical export is familiar by now, and for good reason: it's the classic tale of an elusive musical eccentric, known only for a clutch of unique and mind-blowing bootleg recordings, whose group is rediscovered against the odds by a foreign enthusiast who launches them to international fame decades after their founding. It took longtime producer Vincent Kenis years to track down the original Konono mastermind Mingiedi Mawangu, but the result was a bold recasting of traditional masikulu music that spawned a whole generation of so-called 'tradi-moderne' artists. A "classic" tale because, of course, it's a variation on the archetypal world music story, that of Buena Vista Social Club and Ry Cooder or Ladysmith Black Mambazo and Paul Simon. In the 1980s, when non-western musicians first exploded onto the global market, debate raged among ethnomusicologists: was this to be celebrated as a radical decentring of the industry and the opening up of previously inaccessible musical vistas, or deplored in terms of the production and consumption of difference, the diluting of authenticity and the continuity of former colonial power relations? These days, 'World Music 2.0' seems to offer ways out of the Marxist critique by privileging independent labels, greater equity and the raw, apparently uncompromised sounds of artists like Omar Souleyman or Group Doueh. 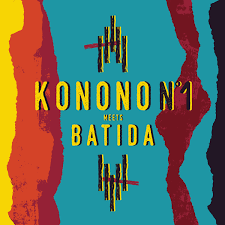 Supported by the Belgian independent Crammed Discs, Konono No. 1 has often appeared as a perfect example of this new paradigm in the ethics and aesthetics of globalised musical production. Still there’s no denying the postcolonial intrigue, and the group’s reuse of old Belgian megaphones (“lance-voix”) stands as a brilliant détournement of the country’s imperial past. For this album Mawangu et. al collide with electronic producer Pedro Coquenão, aka Batida. Coquenão, too, reflects complex histories as a Portuguese-Angolan based in Lisbon and working with Angolan kuduro rhythms and samples. The origins of Konono in the borderlands of DRC and Angola finally connect these two trajectories, providing traction for what is at times a compelling encounter. On 'Um Nzonzig', for example, the trademark frazzled glow and untempered scales of the amplified likembe feel perfectly integrated with Batida's more tightly sequenced language. 'Yambadi Mama' - a standout track - meanwhile witnesses the vivid confluence of Pauline Mbuka Nsiala's potent, commanding voice and Batida's propulsive arrangement. Of the numerous guest appearances it's Lisbon-based MC AF Diaphra that most impresses, delivering his subterranean verses over the opener 'Niele Kalusimbiko'. In general Coquenão does well in combining the synthetic and the sampled, but there are weaker moments too: 'Niele Kalusimbiko' feels lumpy and tired, with a kick pattern that merely disperses Konono's elastic, never-failing energy. It's been widely reckoned that Konono No. 1 is fundamentally a live band, and 2004's landmark Congotronics album arguably expressed everything that a studio recording could. In that sense it was logical to shift the focus towards collaboration, even if 2010's Herbie Hancock link-up was surely a misstep. Konono No. 1 Meets Batida isn't quite the sustained and magical dialogue it might have been, but it's an intriguing cultural experiment with moments of real alchemy.